To describe an uncommon clinical finding and raise awareness of its manifestation and associated conditions. This case describes a gentleman with bilateral plantar fibromatosis caused by type 2 Diabetes Mellitus and previous alcohol excess. Treatment options include physiotherapy, steroid and collagenase injection therapy. Surgical intervention can be considered for persistently symptomatic or recurrent cases. In conclusion, plantar fibromatosis is an under-recognised and disabling condition which should prompt intervention and optimisation of co-morbidities. Plantar fibromastosis is a hyperproliferative disorder of the plantar fascia which predominantly affects males over the age of fifty. Its etiology is incompletely understood; however up to 42% of affected patients also have a diagnosis of Diabetes Mellitus. A 46 year old gentleman presented to the attention of the Diabetes Mellitus consult service following admission for mastoiditis. A review was requested for optimisation of glycaemic control in the setting of type 2 Diabetes Mellitus and microvascular complications. His glycaemic control was noted to be sub-optimal with a recent haemoglobin A1c (HbA1c) of 96 mmol/mol despite insulin therapy and three oral hyp0glycaemic agents. Significant co-morbidities included Human Immunodeficiency Virus (HIV), Hepatitis C, previous alcohol abuse and hypertension. During the course of admission the patient also complained of persistent, severe, bilateral foot cramping. 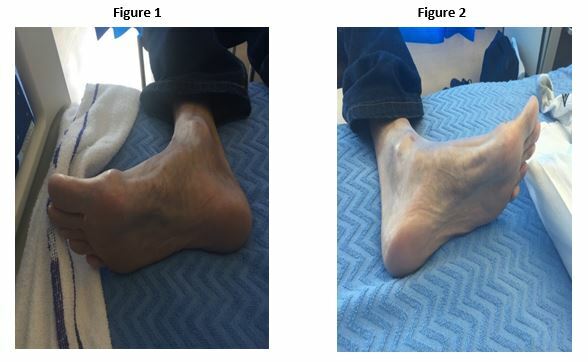 Foot exam findings are depicted below in Figures 1 and 2. A diagnosis of left sided Dupuytren’s contracture of the hand and bilateral plantar fibromatosis of the feet was made. This patient was subsequently referred to plastic surgery for consideration for surgical intervention. Ledderhose Disease (LD) or Plantar Fibromastosis is linked to other conditions of superficial fibromatosis such as Dupuytren’s contracture of the hand, Peyronie’s disease and knuckle pads. Disease of the foot is typically much less common than disease of the hand with only 5-25% of patients with hand disease also suffering from foot involvement. Conversely, Ledderhose Disease seems to strongly positively predict for hand disease, as 50% of affected individuals will display hand changes 1. Despite this, within this population only 25% will have bilateral foot changes 2. While the exact aetiology remains unknown, plantar fibromatsosis of the foot is associated with Diabetes Mellitus and alcohol excess (as in this case), smoking 6 and repeated trauma. There is also evidence to suggest that prolonged exposure to vibration can contribute to the disease 3. No distinct genetic cause has yet been identified 4. It is also known that this disease is up to ten times more common in men than women. While little is known about prevention of LD there are several surgical and non-surgical treatment options. Physiotherapy, analgesia, and steroid and collagenase injections each have a potential role in the treatment of this condition. Surgical therapies are also available and are indicated in persistently symptomatic patients and patients with recurrent disease. The standard surgery in a patient with LD is a partial fasciotomy. It can recur post-operatively in up to 60% of patients 7. In such cases repeat partial or complete fasciotomy can be performed. Radiation therapy can be considered in select cases 5. In summary, LD is a rare condition with a strong male predominance which can cause significant pain and disability if not recognized in its early stages and treated appropriately. 3. Liss GM, Stock SR. “Can Dupuytren's contracture be work-related? : review of the evidence” Am J Ind Med. 1996;29(5):521. 4. Fetsch JF, Laskin WB, Miettinen M. “Palmar-plantar fibromatosis in children and preadolescents: a clinicopathologic study of 56 cases with newly recognized demographics and extended follow-up information”. Am J Surg Pathol. 2005 Aug; 29(8):1095-105. 6. Burge P, Hoy G, Rgan P, Milne R. “Smoking, alcohol and the risk of Dupuytren's contracture.” J Bone Joint Surg Br. 1997;79(2):206. 7. Townley WA, Baker R, Sheppard N, Grobbelaar. “Dupuytren's contracture unfolded.” BMJ. 2006;332(7538):397.